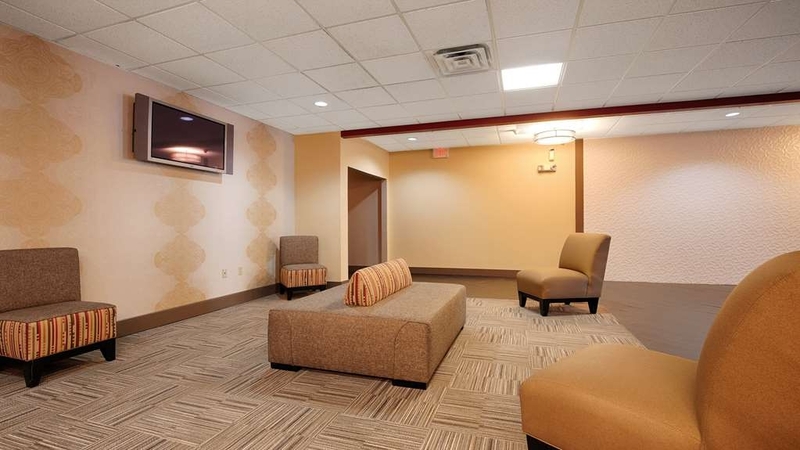 The Best Western Carlisle is ideally located in the center of Carlisle. Come and experience our hotel near the major tourist attractions. Best price guaranteed and exclusive deals. 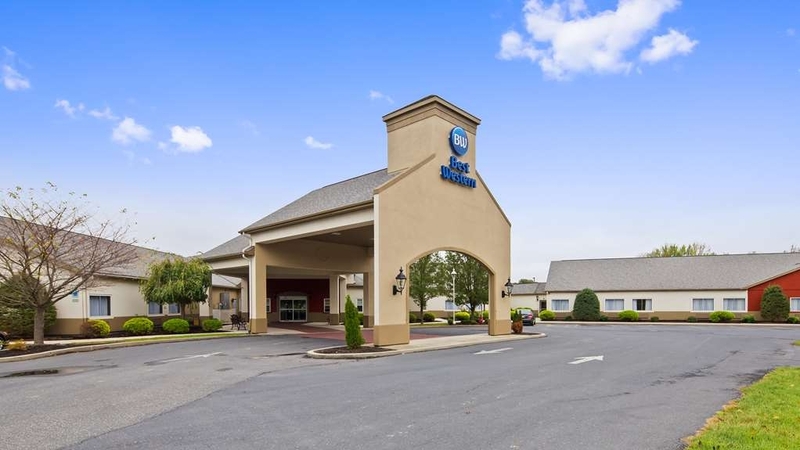 Enjoy convenience and comfort at an affordable price from this Carlisle, Pennsylvania hotel, just minutes from the Carlisle Fairgrounds and Dickinson Law College. 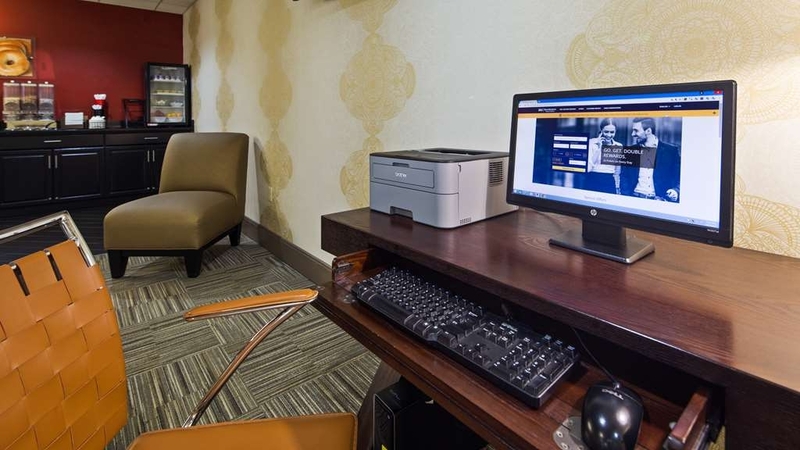 Whether traveling to South Central Pennsylvania on business or pleasure, the Best Western Carlisle is sure to fit the bill. Close to the Turnpike and Freeway 81, this Carlisle hotel offers easy access to the area's top attractions. The Carlisle Fairgrounds, only three miles away, are home to many car shows, antique shows and other local events. Families especially will enjoy spending the day at Hershey Park, only 30 minutes outside of Carlisle, visiting the amusement park, chocolate factory and botanical gardens. There are also scenic golf courses just minutes away. 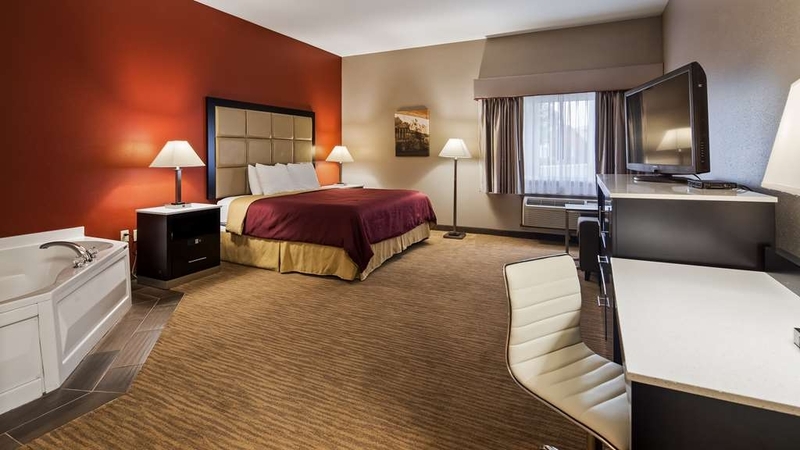 The Giant's headquarters is located within walking distance of this Pennsylvania hotel, ideal for the business traveler. The property is also located within a three mile radius from all local truck stops. 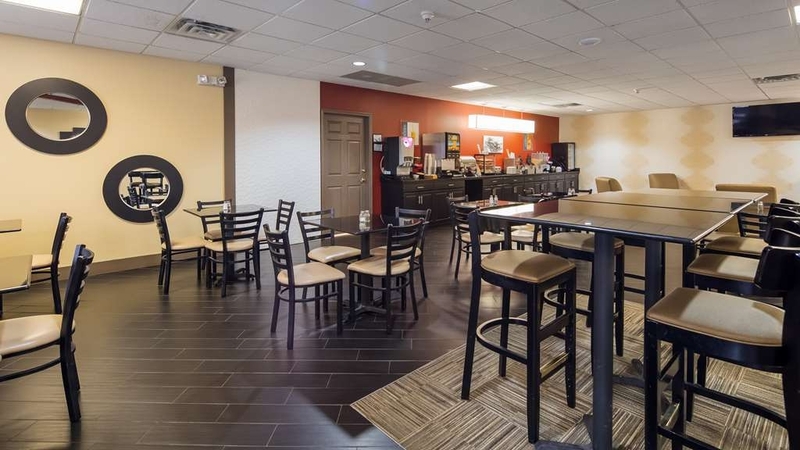 A perfect choice for students and their visitors, this Best Western hotel is close to Dickinson Law College and the US Army War College. The Best Western Carlisle is clean and spacious. It features 73 well appointed guest rooms with cable satellite television with HBO® and free high-speed Internet access. Guests will enjoy an array of amenities, including a complimentary continental breakfast, an outdoor swimming pool, fitness center, guest laundry and business center. For added convenience, this Carlisle hotel also boasts a large parking lot. 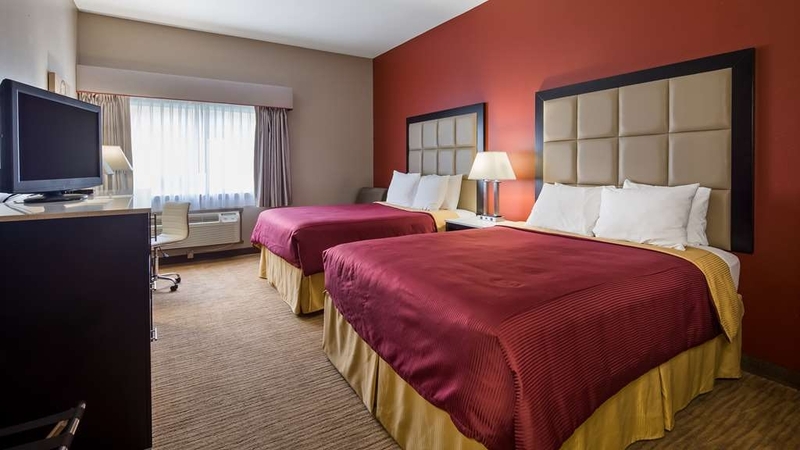 The friendly staff at the Best Western Carlisle is committed to providing superior customer service and comfortable accommodations at an affordable rate. Make a reservation today and see for yourself! Enjoy your stay. We have stayed at this BW several times. It is a very clean and friendly hotel. Staff definitely works to make your stay comfortable. We will definitely stay again next yr. It is affordable and close to our daughters. Very convenient. I ad a very nice room for a reasonably priced hotel. Two double beds. Plenty of USB ports and electrical outlets. AC / heat worked well and was quiet. TV was nice flat screen. Bathroom and shower was also nice. Breakfast was OK for a hotel breakfast. staff were all very nice and accommodating. "New favorite place to stay in Carlisle Pa"
"Fine, Friendly Folks and an Excellent Facility!!" Arrived Late at Night and Alone, in a Rain Storm. Fortunately "Belma" was on the Front Desk!!! She was very Kind, and Arranged a Room for me, Promptly. As I spoke of my Planned Itinerary for the Next Day, she Helped me Orient and find the Best Routes to my Destinations. She was Wonderful, Insightful and Very Helpful!!! The Room was Excellent, Clean and Quiet!! Breakfast the Next Morning was Most Excellent. I Recommend this Facility for Everyone!!! "Quiet rooms -- no extra pillows?" The rooms are clean and quiet. I requested extra pillows to support my splinted arm during the night and was told they had no extra pillows. That just doesn't seem at all reasonable. "included" Breakfast is meh. Go to Middlesex Diner a few miles down the road for an excellent meal instead. "Be attentive to the entire bill and not only to total amount due like i did. Suppose to be 69.99$ but it has been 89.99"
Carpet very humid feel water troughout my sorks, but the hotel is quiet, coffee 24 hre into the lobby, a good restaurant just behind the parking, the buffet on the morning is very good. My deception is that i have not paid what the person at the reception told me. He told me that i will paid the same price as my brother in law and he has made a reservation for 2019 since my brother in law didn`t know he was doing that to get price at 69.99$. "Nice stay, nothing fancy, would recommend"
Our family stayed here for one night during a road trip. Good stay, nothing fancy, but meets expectations and was a pleasant stay. Good staff, good breakfast, clean rooms. We did not use the outdoor pool but it looked clean. "Great stay for reasonable price!" Very clean hotel with convenient turnpike access. Comfortable and quiet room.Good hot breakfast, eggs, bacon, waffles. Even waffle toppings and chocolate milk! Exercise room had newer equipment. Friendly staff! "Sad old hotel, family run, and run down"
I know you get what you pay for in life, but this was a little too much on the cheap side. My family stayed there on 8/21 as a stop over on our drive home from vacation. The hotel looks nice from the outside and the lobby is nice, people are friendly... But the rooms are old and in poor quality. The first room we checked into had a broken desk (pictures attached). The staff was nice and gave us another room right away, but that one had a broken chain in the toilet and would not flush. It was fixed easy by me and a paperclip, but still it was another issue. The chair was stained (pictures included) and the beds are lumpy. But perhaps the worst part is the TV uses satellite, not cable. So when the weather is poor and you are stuck in your room (like for us) we had no TV! Also, to round out the issues, half of the USB charging ports were not working. On the plus side, the location is easy to get to off the highway, the Wi-Fi is strong and easy to log onto, and the breakfast is good. Overall this is an old hotel that is clean and clearly trying to be nice place to stay, but it is just not there yet. Very nice rooms, the folks that work there were VERY nice to all of us. I will be staying here on my next trip. We had a car trouble, and the staff was very helpful to help us to get thing back on track. The room was very clean, And the price I paid outstanding. This was a really great hotel and we would stay at again. It was small and not very busy. Our room was clean and comfortable. The breakfast was really good and there were a lot of choices. We didn't use the outdoor pool, but it was smaller, deepest was 4'8", and clean. The front desk and lobby made a good impression. 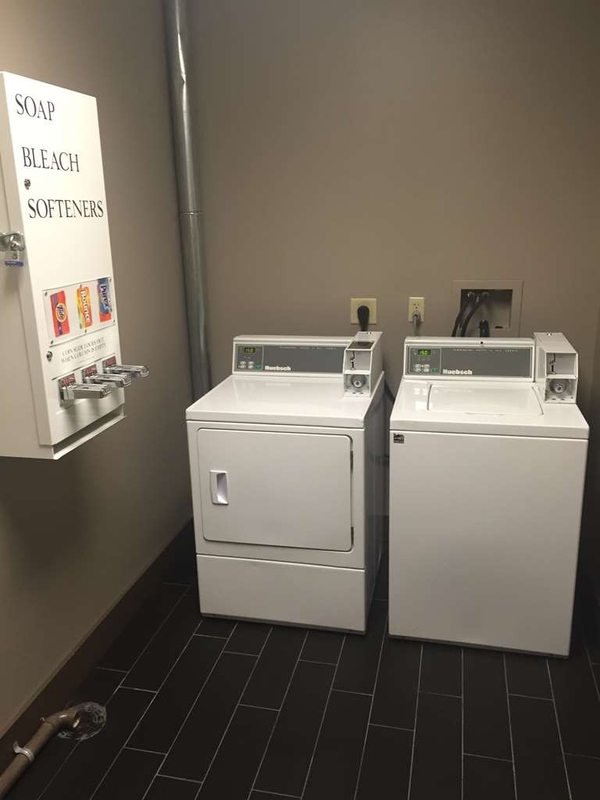 They were clean and the staff was very pleasant. The room was small but clean. The mattress was very soft, not to my liking. All in all not a bad place for the price. We stayed here on our way to Philly. It was a nice hotel with clean rooms. They front desk girl was friendly and polite. They have an outdoor pool, which is a little small but did it's job on a hot afternoon. The beds were comfortable and we slept well. The halls were quiet and there wasn't any noise from the road either. Many places to eat near by and a few within walking distance. Breakfast was just your average hotel breakfast with a few hot foods and cereal. We would stay here again. This hotel was fine, but not much more. Maybe for the area, it works well, but I did not feel the value was there. Breakfast was better than a continental, but quite simple compared with others. Location is easy to access, but watch out for the Berm of Death at the exit - not the hotel's fault, but scary that you can't see traffic coming from the left as you exit. "Good on our way down south - not so much on the way home!" We stayed here in March, on our way to Florida from Canada. We enjoyed our stay, the room was clean, spacious, and close to the lobby. It was quiet and the breakfast was good. We were impressed and stayed here again on our way home in April. The lady at reception is super friendly and helpful, but other than that, the second stay was a very different experience. The room was far away from the lobby, it was not as clean, the fridge was completely frosted up and needed to be defrosted, and there was a barking dog in one of the rooms near us. We usually stay at Hampton Inns when travelling south (and returning) from Ottawa to South Carolina, We decided to try this Best Western, less expensive than the standard Hampton Inn rate. It was not a nice as Hampton Inns, but it was fine. This is an older property, but rooms have been updated. Staff were pleasant and efficient. Breakfast was not quite as good as Hampton Inns, but was adequate, some fresh fruit, yogurt, cereal, eggs, waffles, various muffins, etc. It is located about five minutes off the I-81. If your traveling in Interstate 81 this is the place to stop. Close to the interstate. The staff is very friendly and informative about the area. Rooms have refrigerator and microwaves if you pack your own food to heat up or make popcorn. There are paper plates, utensils and napkins in the lobby. . The also have a variety of take out menus which delivery right to your room. Rooms are clean and beds are very comfortable. Breakfast which is included is good. Fresh make your own waffles and pancakes. Cereal, muffins,yogurt with toppings. Coffee which is good and an assortment of juices. "Older Hotel, But With Small Upgrades"
We were traveling thru PA, en route to Reading. This was a nice place to stop for the night. We used BW points for a free night in a two queen bed room. We preferred a King Bed room, but, when using points, our only choice was a room with two queens, I guess. The hotel is an older one, but with various small upgrades throughout the place. Our room was more of the same. A nice wide TV stand in the room with a granite top, comfy bed, and a nice hot shower with good water pressure. Parking seemed a little limited, as we had to park around the building from our room, though. My daughter and I needed lots of outlets for all our electronic devices and BW provided that. The WIFI worked without cutting out. The room was clean and well kept. Breakfast was really nice. We enjoyed our stay will recommend this hotel. "Nice Respite After a Long Drive"
We came late and our King-sized bed was reserved and waiting for us. The front desk was very welcoming and our pup was pleased to have a quiet corner in which to sleep! Breakfast was good and check-out easy. We stayed here over night on our way to Myrtle Beach and this hotel worked just fine. The price was right and the location worked for us. They have a good continental breakfast, that helped get us on the road to continue on to our next location. The rooms here were larger than most Best Westerns we have stayed at. 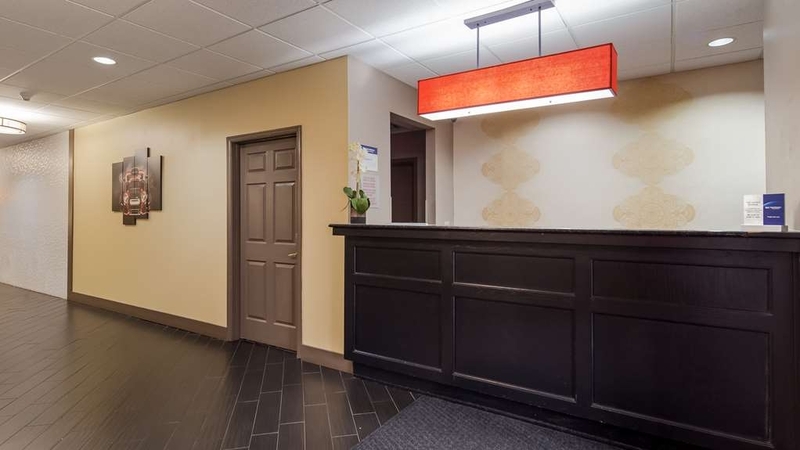 The hallways were not as “newer looking” but friendly staff and great deal overall. Would definitely stay again if passing through. We have stayed at this hotel before and always found it to be a clean and friendly place. The hotel staff always greeted us with a smile. The room was clean and comfortable, no issued with the internet or beds, the shower had nice hot water and the breakfast was completely satisfactory. No issues here! And it was easy off/easy on to the highway. The best Hotel in Carlisle. Clean rooms, Excellent and very friendly people in reception. It is also very convenient as far as for the location of the Hotel. Reasonable price also. Breakfast nice. overall very good. I would recommend to everyone. Our stay at the Carlisle Best Western was very enjoyable. The staff was very help, especially the woman who checked us in. She went out of her way to ensure we had a room that suited our needs. We were very impresses with the level of care shown to us and would not hesitate to stay at this hotel again. "First stop an route to FL"
We can recommend this very good hotel to any traveler. They could have more choices for breakfast. It is near the I-81 and it is easy to find. This was the second year we stayed here. We intend to continue coming here in future years as well. On our way to Florida from Canada, it is a good location for a stop over after a good day's drive. It is located reasonably close to Interstate I-81 in a quiet location. A family restaurant is right next door, so it is very practical not to have to drive to go to a restaurant. Personnel very friendly and helpful. Interesting. One floor hotel. You are guaranteed no one above you. Off interstate so nice and quiet, The beds are good and comfy. Smelled like smoke in hallway. Wish people would STOP smoking in non smoking hotels. But the room was fine. Walking distance to good restaurant. Another great budget hotel in Carlisle. Third time I visited my daughter at College and all hotels have been great. 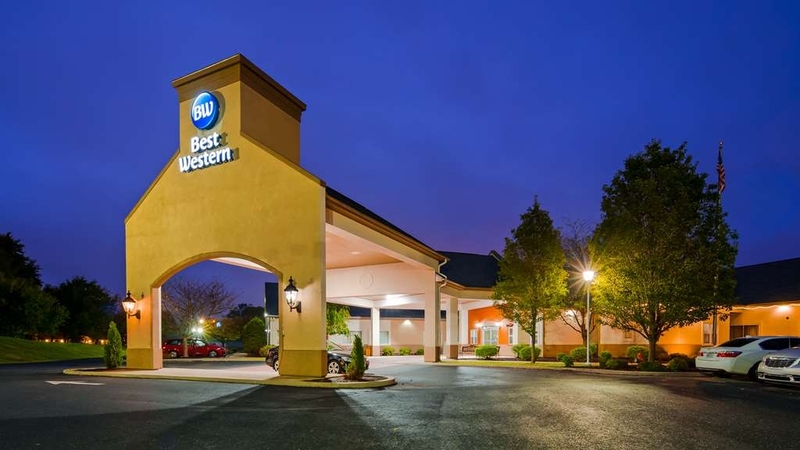 I was worry about this Best Western because of the low price and some reviews, but ended up being a great clean and comfortable stay. The other two hotels had better breakfast and facilities but if you want to save few bucks, this hotel is fine. We have stayed here 10 times while at various Car Collector Events at Hershey & Carlisle PA. Great location, with many high quality Restaurants near by. Great rooms space and super quiet given the high traffic volume near by. Amenities were great. Breakfast was excellent! Parking was close to our room. The atmosphere and environment was very pleasant and welcoming. Rooms were very clean and so quiet. Staff was very knowledgeable and friendly. The only thing I did not like was the strong smell of air fresher or something they cleaned with since I have allergies. The smell was a bit overwhelming!! Enough to make me LOOK for BW on the road from now on. The room and the friendly and knowledgeable staff were sincere in their desire to make my stay pleasant and well worth the reasonable price I paid for the room. "Easy off highway.. beds great!" "Seriously gone down hill "
This room had a refrigerator that had high pitch whine to it every time it recycled. No turning it off or unplugging it . The bed was excellent but who can sleep with the noise. Micro wave was not plugged in . Couldn't find socket. No table lamp on one side of bed. Stains on carpet. Good shower. Staff was friendly and courteous. Breakfast was plentiful. I would recommend this hotel if anyone was going to the chocolate factory it is only 35 min away. I didn't it use the fitness area but it was also tidy. Just stayed there overnight, but convenient location and hotel is good condition, with breakfast, wifi, etc. (did not use the pool but looked like nice pool area). Plenty of room and comfortable. Includes fridge & microwave. "Not Bad...Should Have Been Better!" I am a Rewards Member and have stayed at many Best Western properties. This property was not one of the better ones. The employee checking me in was not the friendliest or very helpful. The property had a lot of broken glass in the parking lot and a strong smell of marijuana in the hallway. Used a highway guide coupon and got a great deal.Ben at front desk was very helpful.Room was clean and bed was very comfortable.We would stay here again.It is a single story hotel which makes access very easy. Good night sleep on a very comfortable bed. Only drawback is an outdoor pool. Nothing for little ones to do after long day of travel. Best Western calls Breakfast Continental, but I disagree eggs, sausage bread, bagels ,english muffins, different pastries as well as yogurts and fruit. I've received less at a comfort inn than here. Very Satisfying. "Hotel was great, but ........"
The hotel was beautiful, and a great value. The young man at check in even suggested a nearby restaurant. However, when reviewing my credit card, I was charged an additional $20! When I called they said it was because there were (2) pillows missing, and we were charged for them! They reversed the charges, but I was highly insulted! I think more should have been done! Expensive for the poor amenities which they do not offer. Food was cold and bland. Bathroom door tilted broke The staff was helpful however they did not make an effort to discount the stay insisting that they only had suites. Nonetheless the sleep and quietness was excellent. The energy efficent lights are annoying as can be. Rooms are clean with comfortable beds. Friendly and accommodating staff. Microwave and minifridge in room. Outdoor pool. Excellent breakfast selections. "Great stay at the Best Western"
Myself and a group have stayed at this motel at an annual event since it first opened ,We have always enjoyed this motel . we had not attended the event for about 4 years and were pleasantly surprised with the renovations . Over all a great place to stay ! "Great, but what's with the lights?" I travel for work and stay in a lot of hotels. This is a very nice hotel. The staff is friendly, the rooms are clean, fridge and microwave in the room, and the beds are nice and soft. My only complaint would be the lights that are motion activated or on timers. I get they want to save energy but I got up in the middle of the night to use the restroom and couldn't turn on the light on the bedside table. You have to walk over to the door and tap the button to make it work. The bathroom light and the sink light are on timers and there was only one light that would stay on in the room. Hope you like it dark. It's not really an inconvenience but sure is annoying. Hotel was sufficient for what I needed but not something I would reccommend for the frequesnt traveler. Price on TripAdvisor said $66 and we were charged the AAA rate of $89. we showed the desk clerk the dvertised price but that was of no benefit. Well, we arrived late, check in wasn't bad, parking took a while to find. It was a large room and nice and clean. Breakfast was the usual continental. My big issue was the motion sensor in the bathroom for the two lights and fan. I could not figure out to make the light and fan stay off, believe me, I tried. A middle of the night visit to bathroom was eye opening and startling, to say the least. Other than that it was a solid 3 to 4 stars, the noise level from the hall was high, and that would be the only reason I would not give it 4 stars. The Map Quest directions to this motel were not accurate, so I had to stop and call. The young lady on the front desk was helpful and friendly and directed us to the site. The stay was not bad, but they do need to provide more lighting for the rooms. Ours was like a cave. When I spoke with the same young female clerk about this, she said that the motel planned to purchase new lamps. Okay for future guests, but we did not receive any discount for the deficiency. Breakfast was okay, nothing special. I also learned that Best Western is very animal friendly. Therefore, if you do not like dogs, book with another chain. "Cheap thru Priceline and OK"
Clean bed and a shower is all we needed. That's all we got with a little breakfast and wifi. Nothing wrong. It was fine. Everything worked as expected. The place is 1 floor and huge from end to end. Not bad. I always stay at this Best Western and I have NO complaints and always leave relaxed feeling like new! The entire staff was very eager to help out with all my needs and housekeeping was nice enough to get my ice bucket filled being that I am handicap and wasn't able to walk the distance where the ice machine was located. Excellent customer service! Hotel needs new staff and lots of work. My room had several broken items that were repeatedly brought to the front desks attention but were quickly dismissed with no resolution. It took me three days to finally get my room switched to a better room where everything was working. The morning staff are a bunch of zombies that have been trained as vegans!!! There is one person who maintains the breakfast area and she will literally make like 15 trips back and forth to the kitchen to refill one item.......for example, they ran out of sausage links, so she literally went back to the kitchen and heated up like 2 links at a time until she could catch up!!!!!!! She made about 18 trips before she finally started to stash up some extras for the next wave of people!!!! Why don't they just hear up like 20 at a time and bring them out?!?!?!? 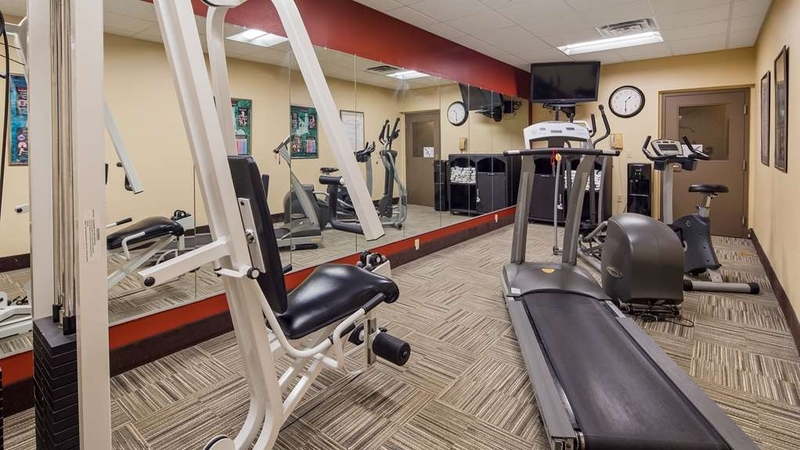 The fitness center in the hotel is a joke! On a vacation trip. Room was clean and the service excellent. Can recommend this property unconditionally, We'd visited Gettysburgh and planned to drive PA11 to learn about the Cumberland Valley. Great place. It's a typical Best Western, you know, the no frills type motel. Stayed here for the first time and it was okay and not that I expected it, it didn't exceed my expectations. However, I would consider staying here again if I had to. Read some goos reviews on this hotel so i decided to give it a shot. I went for the GM nationals june 23 -25th. The room that I was in had a funky odor. Also there was a stain on the blanket on the bed and also a stain on a towel. It felt so scuzzy that my mom and I decided not to stay the 2nd night. We came from long island ny which is 5 hrs away and we did the trip there and back in 1 day because of it. The pillows were terrible and the bed was not comfortable at all. Walls seemed thin because you can hear everything. Such a terrible experience. I will say this, the hotel is refunding my money for the 2nd night that I did not stay. I just had to pay a $20 fee for a late check out which I didn't mind. Again, just talking about my personal experience. Thank you. "Nice place to stay when we come to the Ford Nationals"
This hotel is affordable and well located for our trip to Carlisle. The staff is great. It is located in walking distance to a restaurant and right off the turnpike. The breakfast is well maintained and the hotel in general is clean. Poor service and run down. That's the only thing we could say. We made a reservation for 2 queen size beds and confirmed the reservation the day before we went there. When we got there a little early, we were told the room was not ready yet. We came back and were given a room with 1 king size bed. When we asked to get the room we really booked, we were told by the general manager to read the fine print and that they can change our reservation without notice. After some back and forth, the only option we were given was to either go somewhere else or take their offer. We were dumbfounded because we were getting this treatment from a general manager. In the end, we ended up going across the street to the Holiday Inn. The pictures are deceptive and the rude treatment put the cherry on top of our mother's day weekend. Stay elsewhere and avoid this place. Thank you for your review. We apologize for your experience. On the day of your arrival we did have 3rd party overbooking issues. We did our best to accommodate our guests by booking rooms at nearby properties at the same rate. This happens often in this business and we do apologize and do our best to rectify these situations. As far as the pictures, you are correct the are deceiving. All of our online photos show the old furniture and has not yet been update to reflect our current beautiful oak wood furniture with genuine granite tops. The rest of our property has been fully renovated as shown by our online pictures. We hope you will reconsider and come see us again. "1st visset to best western"
Great place, nice people and nice atmosphere. Breakfast is also good. Rooms are clean. Quiet place to stay. Beautiful place to stay.Recommended for everyone. Has also a outdoor pool. Overall very satisfying. This was my 2nd stay here, making the trek back from vacation in South Carolina to Maine. Safe, quiet, comfortable, just right. I travel with dogs and there's plenty of good space to walk around the grounds with them. "Some rooms are better than others"
Stayed here on our way home from Florida. The hotel is on the outside of Carlisle. The room was clean but had problems with TV. Someone had to come to the room. We were given a coupon for restaurant next door. Don't bother. Nothing was appealing about this place. Large and cold looking with food the same way. Hotel is a fair value. 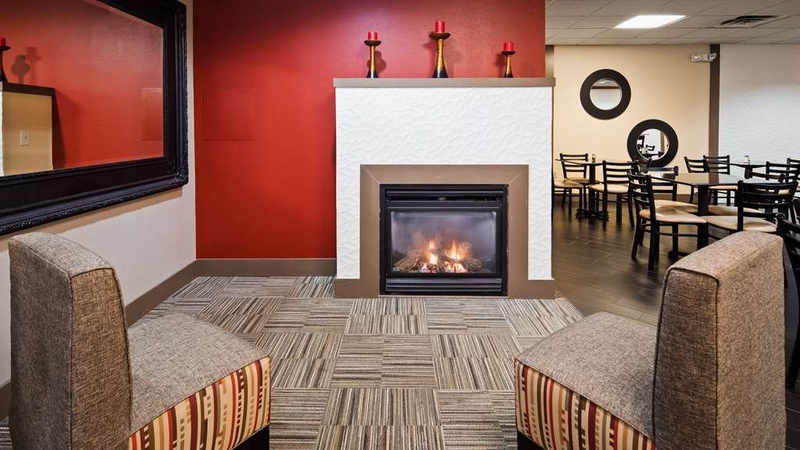 "An economical stay in a convenient location"
We often stay at this Best Western on the way to see family. The friendly caring stall always go out of their way to great you and ensure your visit satisfaction. A wonderful experience. They have recently upgrade their furniture in the guest rooms. While there are not many frills what they offer is delivered with a friendly smile. We enjoyed a lovely comfortable stay at Best Western Carlisle on our way to Florida. 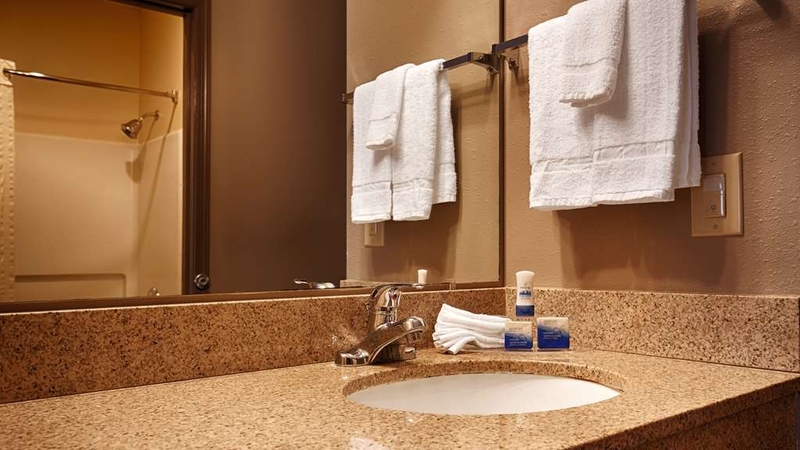 The room was very clean and we were so happy to be upgraded to a room with whirlpool tub. After being on the road for 9 hours, it was relaxing to sit and soak for a while. We would highly recommend them as a good place to stay. "new furniture ready to be installed "
clean, convenient. good value for the money. lighting poor, no nightstand or light on right hand side of bed. one annoying thing when I reported that the toaster was not working, he took so long to come over & fix it that we gave up on the bagels & ate something else. that instance was blatantly poor customer service. "Little hard to spot on a dark night"
Very good location near I81 and Penn turnpike. Busy local road network but hotel is set well back and noise was not an issue. One night stopover on a road trip returning from FL. Good choice, clean comfortable and secure. Signage is always subject to local zoning rules. This hotel property is set back from the road and not readily identifiable on a dark night especially after a tiring day of driving. Tip, there is a brightly lit motel6 sign out at the edge of the road and the best western property is set back behind theirs. Simply turn at the Motel6 and you can see the Best Western behind and slightly below road elevation. We had to stay here at the last minute when the BW up the interstate lost power in a wind storm. Did not know what to expect. But turned out to be more than acceptable. Convenient to restaurants and to the interstates. Lots of semi trucks moving through town. Just one floor to the building. Front desk helpful. Room had minifridge and microwave. Bathroom had fan. Clean spacious room with a king bed. 4 pillows on the bed. Would like to have electric outlets on the bed lamps. The nicest BW I've stayed in. Friendly front desk. Indoor hallways, clean, and quiet. The room was spacious and everything was well kept up. We felt safe staying here. We are a couple over 69 and this was important to us. Good breakfast. We stayed here for one night on our way to Pittsburgh. The check in was quick and easy and the girl behind the desk was very friendly. We were given a room on the first floor. The hallway had a musty smell to it, but the room was clean and did not smell. It was very quiet at night and we had no problems during out stay. "Room was okay but the staff? Well..."
My daughter and I had been driving for several hours and ended up with a flat tire. After getting the spare put on, we were exhausted. We decided to stay at this hotel for the night. The young man who checked us in was not very friendly at all. NEVER smiled! When we told him about our flat tire and we were exhausted, he never even acknowledged that we were even talking! He had very little to say...kind of using as few words in a sentence as possible. I will say this though...he started at $89 but he ended up going down to $79. That actually was the price advertised on my Google Maps. I was happy that he saved me $10 though. The room was clean and comfortable although the beds outer edges were hard. Once laying down though, it was comfortable. The phone did not work either. We were there only 1 night so we didn't care too much. "Great Place for a great price and Handy to great food." Great place to stay for a night or so. Handy to the Turnpike but not so close as to interfere with a good night's sleep. Great Breakfast. Didn't used the outdoor pool. Clean rooms with very comfortable beds. Even let us park our motorcycles under the roof out front for the night and kept an eye on them for us. This is a clean hotel in a quiet area conveniently located off the Pa. turnpike.The beds were comfortable. The rooms were clean. The staff was very friendly and accommodating. It's a good place to stay for a quick overnight. The room rate was a fair price. I definitely recommend this hotel. I couldn't find any rooms in the area and ended up at this hotel. Honestly, my expectations weren't high - I was hoping to be able to sleep without too many problems. Belma at the service desk was incredible. She was positive and upbeat with a great recommendation for a place to eat. She made my stay excellent. If I stay at a Best Western in the future it is due to her attitude. "Nimesh was a wonderful help"
I never write reviews but I had to give my genuine thanks to Nimesh who helped me with a reservation problem. He was working the front desk and was so kind to me. He was pleasant and accommodating. He was patient while I was on the phone with the booking site, which helped since I had been driving for hours and couldn't think straight. I would have never solved the problem without his help. He is a great asset to Best Western. I work with the public so I know a professional when I see one! The room was fine and a decent price. But the employees is what makes this place get 5 stars. I chose Best Western in Carlisle because it was the only one close to where we wanted to visit that had a jacuzzi tub, but I was disappointed in the room.The tv too small and the way it was positioned hurt your neck to watch. Breakfast was so so. The staff was great, very friendly and helpful, but probably wouldn't stay there again. very pleasant stay, check in staff, housekeeping, breakfast, was very nice, close to fairgrounds, restaurants and fast food. access to the entry could be a little more visible from the road. Pre-booked for next year already. Would definitely recommend to friends. Dear Valued Guest, Thank you for taking the time to review our property. Your feedback is important to us and will be used to implement any changes to ensure our guests in the future have a superior experience. We have passed on this great review to all our staff and are happy they created a very welcoming environment for you. Regarding our entry-way, we have actually ordered a new sign with the new Best Western Logo to place at our entrance in a more visible manner for our guests. We are happy to hear we will be seeing you again next year! Thank you. The staff at check in was not very friendly. I was trying to ask a question and he ignored it. My husband also had a question which was not answered. We missed our continental breakfast because the front desk person didn't answer that question - I noticed the sign on the wall with the time of breakfast at checkout, but not when we were checking in because we were just too tired. If the staff was attentive enough to answer our questions, we would have been able to take advantage of the complementary breakfast. The room was also not very clean. The toilet seat looked like they cleaned it with dirty water. The bathtub also looked dirty. They could have done a better job vacuuming the room as well. We found dog or cat food pieces in the non-pet friendly room. The fire alarm also went off for quite a while, but that they couldn't control - it was a broken pipe and they fixed it. The lady at the checkout was nice. The location was also very decent. Dear Valued Guest, On behalf of our entire staff we would like to apologize for not exceeding your expectations. Your feedback is important to us and will be used to implement any changes needed to provide our guests in the future a pleasant superior experience. We have spoken to all of our front desk personnel addressing this review as we expect our front desk to create a welcoming environment for all our guests. We have made it a point to make sure they understand proper etiquette regarding any interaction with our guests instead of making them feel ignored as you have mentioned. 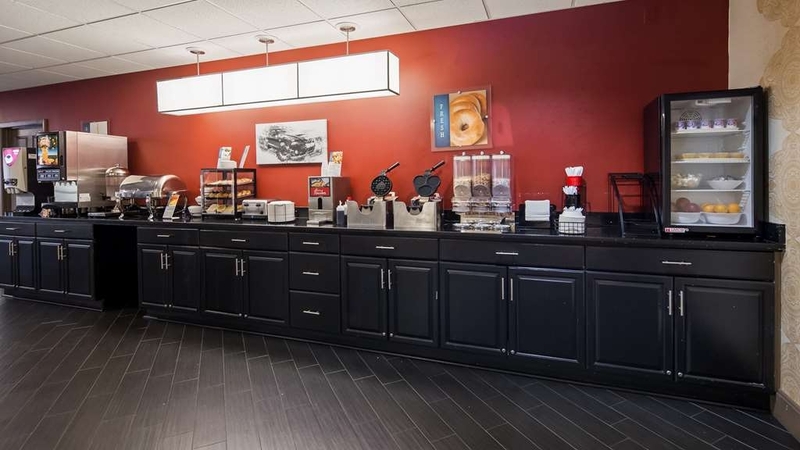 In addition, we made it clear our front desk personnel should be providing any additional information to our guests such as breakfast times to help in their check out process as well. Regarding your housekeeping comments, we have addressed all of these issues with all of our housekeeping staff as well. If you could provide any further information to us please feel free to contact me directly at [email protected] so that we may also find out who our front desk associate was that checked you out and pass on the great review to her! We hope that you will consider staying with us again in the future. Thank you. Another nice stay at a Best Western. Understanding from the reviews this is a recent renovation. Bathroom smaller than previous BW, but very adequate. Toilet seat needs to be fixed. Front desk recommended Middlesex Diner and it was delicious. Breakfast buffet was ok. The regular coffee seemed slightly flavored. ?? Dear Valued Guest, Thank you for taking the time to review our property. Your feedback is important to us and will be used to implement any needed changes to ensure our guests have a superior experience with us in the future. We are also continuing our renovation process as well. Middlesex Diner is a very popular location in the area for some great food close by and we are happy to hear our front desk clerk was able to provide you with a great recommendation. If you have any specific suggestions for us, please feel free to contact us directly by emailing [email protected] Hope to see you again soon! i stayed in room 114. when we checked in, the woman working the front desk was being mean to customers checking in. when we got to our room, the carpet molding on the walls was coming off.. despite what everyone else says about the beds, they WERE NOT comfortable. just a mattress topper on a crappy bed. the pillows were paper thin. the comforter was rough and scratched me. the food was disgusting and slimey. if i could give 0 stars i would, when we checkd out, a man i assume to be an owner, told us that out room rate was charged to the card and that was the only thing that would hit the card. come to find out, they DOUBLE charged the card and ruined our weekend. id rather sleep in a gutter. DO NOT STAY HERE!!!! DO NOT STAY HERE!!!! DO NOT STAY HERE!!!! Dear Valued Guest, On behalf of our entire staff we would like to apologize for not providing you with a superior experience. We do value your feedback and will be using it to implement any changes needed to ensure a superior experience for our future guests. We will be addressing any attitudes with our staff regarding this review and have also hired on an available maintenance personnel to assist our current maintenance staff regarding issues you have mentioned. In addition, this property is in the process of having some renovations done including providing more updated furniture etc to ensure our guests are more than satisfied with their stay. We hope you would consider staying with us again in the future. Thank you. "Went to Mopar car Show"
Dear Valued Guest, Thank you for taking the time to review our property. Your feedback is important to us and we will be using it to implement any changes to ensure our guests have a superior experience in the future. 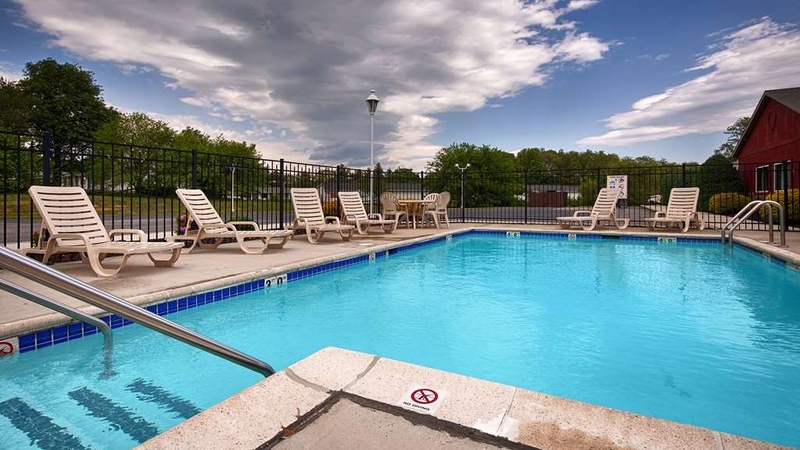 We are happy to hear our pool was a great way to cool off after enjoying a day at the car show in town. We are also looking into more ways to improve upon our breakfast options as well. If you have any specific suggestions please do not hesitate to contact us directly at [email protected] We hope to see you again soon! Stayed here one night with my daughter when we were visiting colleges. Hotel was very clean, big room. Bathroom was small and somewhat dated but overall a decent place for an overnight stay. This place offers a continental breakfast complimentary. Although we did not have it, it looked good with several options. Dear Valued Guest, Thank you for taking the time to review our property. Your feedback is important to us and we will be using it to implement any changes needed to ensure our guests a superior experience in the future. We are happy to hear our rooms are very clean and spacious. As for the outdated feel, our property is about to under go some new renovations to improve upon this as well. Thank you again for your feedback and we hope to see you again soon! We stayed here on our way through. The room was nice and it was clean. The staff were very friendly at check in and out and for the morning breakfast. We would stay here again. The bathrooms are simple tub and toilet with the sinks in the main area. Nothing fancy but we didn't pay for fancy. It was clean and comfortable. We checked in extremely late and the gentlemen on the desk was extremely friendly. Dear Valued Guest, Thank you for taking the time to review our property. Your feedback is important to us and will be used to implement improvements to ensure our guests a superior experience in the future. We are very happy to hear all our staff created a very welcoming experience for you! We will be passing on this great review to all of them and we hope to see you again soon. "Two night visit for Carlisle Chrysler Nationals at the Fairgrounds"
Stayed two nights at the Carlisle Best Western. The hotel was just recently renovated and is in decent shape. The room held two queen beds, a fridge and microwave, and had the usual A/C unit under the window. Beds where clean and comfortable, bathroom was very clean and excellent water pressure and temp. Pool was very clean, also. The free breakfast was the usual fare, but nothing special. Dear Valued Guest, Thank you for taking the time to review our property. Your feedback is important to us and we will be using it to implement changes to ensure our guests a superior experience. We are happy to hear our beds were comfortable and everything was clean. We are currently also looking into how we can improve upon our breakfast options. If you have any suggestions for us at all, please do not hesitate to contact us at [email protected] We hope to see you again soon! "Husband suprised me by a get away"
We stayed in a king room with a whirlpool. The room was very clean and had everything that we needed. Breakfast included bacon, eggs, french toast, waffles and much more. Gracie at the front desk was great. We would definitely stay here again. Dear Valued Guest, Thank you for taking the time to review our property. We are hear your husband's surprise made your stay all the more special. We agree Gracie is a great asset to our team and will be passing on the great review to her and the rest of our staff! We hope to see you again on your next visitation. "House for the Hounds, including the rest of the Family...."
Dear Valued Guest, Thank you for taking the time to review our property. Your feedback is important to us and we will be using it to implement changes to ensure our guests a superior experience. We are happy to hear our staff was able to create a welcoming experience for you. We will be passing on this wonderful review to them! We hope you will come back to see us again soon. If I can be of any assistance in the future, please do not hesitate to contact us. "Great Hotel - Comfortable Beds"
We had a great experience at this hotel. Beds were comfortable, room was clean, lots of breakfast choices and was good. Great access to the fairgrounds for the car show we attended, especially since the office building next door left their exit gate open so cars could take the back way out of the hotel and out to the stop lights rather than trying to make a left hand turn. We enjoyed our stay well enough to book a room for next years' show when we checked out. Dear Valued Guest, Thank you for taking the time to review our property. Your feedback is important to us and we will be using it to implement any changes to ensure our guests a superior experience. We are happy you enjoyed your stay and are looking forward to seeing you again next year! "Not what we are accustomed to when staying at Best Western"
This property was tired in both feeling and looks. Honestly, we've stayed in rooms at the budget-oriented Red Roof Inn chain that were more updated - and about half the price. The front-desk associate was apathetic, and this attitude is not in keeping with what we are accustomed to at Best Western. However, the lady responsible for breakfast service was quite proactive and friendly; she is the reason we gave the property the 3rd star. Perhaps this property should promote her to front desk manager; she could teach the others a thing or two about proper customer service. Dear Valued Guest, Thank you for taking the time to review our property. On behalf of our entire staff we would like to apologize for not exceeding your expectations. Your feedback is important to us and we will be using it to implement improvements to ensure our guests are provided a superior experience. We will be speaking with our front desk associates and agree our breakfast attendant has superior customer service skills! We will be letting our front desk associates know they can always learn a thing or two from anyone with superior customer service skills and passing on this great review to her. Thank you again for your time and we hope you will consider staying with us again to give us another chance at providing a superior experience. They didn't have any double bed rooms left so they brought in a very old cot which needed three layers of blankets to not feel the coils in it. We had an air mattress for one child but our third had to sleep on the floor. Breakfast was good. Dear Valued Guest, Thank you for taking the time to review our property. Your feedback is important to us and we will be using it to ensure we provide a superior experience for our future guests. We agree, that cot is old. We are absolutely in the process of ordering new cots to have available when a double bed room is unavailable to help accommodate our guests. We are also happy to hear you enjoyed our breakfast and will pass on the review to our breakfast attendants. We also hope to see you again on your next visitation! "Stay but don't eat the Breakfast"
I enjoyed the hostess, the room, and the ease of the location to what I had to do. The breakfast needs some help to make sure there are more sanitary methods for food consumption. The hostess was kind and helpful but don't ask for directions. The room was spacious and clean but dimly lighted. The location was right off the major hi-way(s) and not hard to find. The breakfast needs more sanitary methods of producing food. The Hotel is correct, and the room was very clean. Off the main road to reach the hotel is a bit confusing, as the is another motel around it and no clear indication of the Best Western. There is no lobby area, but rather the Breakfast area. But overall, for a sleep, the value for the money is very good. Definitely, I would recommend the hotel to friends visiting the area. Dear Valued Guest, Thank you for taking the time to review our property. Your feedback is important to us and will be used to ensure that we exceed expectations of guests in the future. We agree and are in the process of ordering a new Best Western sign that would give our guests better indication of our location on that road. We are also pleased to hear you had a great night's sleep. We hope to see you on your next visitation! "HUMAN POOP IN THE POOL!!" We booked this hotel for the price, convience & THE POOL!! We traveled 3 hrs & in all honesty really did book here because they had a pool!!! Saturday evening we returned from dinner with over 3 hours to use the pool facility. When we got back there was a sign "swimming pool closed." My mom then called the front desk to ask and we were told that some decided to use the pool as their personal toilet & they let their child TAKE A CRAP IN THE POOL & it was not going to be for usage for 24+ hours!!! The hotel was booked to capicity & sunday morning breakfast was not ready for a hotel FULL of families! They were short staffed & deffinatley not ready for a breakfast crowd with a full hotel!! As a mother, you know your child & most of all when children are swimming the most important & most frequently asked question is " do you have to use the bathroom?!?" NO PARENT UNDER ANY CIRCUMSTANCES SHOULD ALLOW THEIR CHILD IN A PUBLIC SWIMMING POOL IF THEY HAVE NOT USED THE BATHROOM!! As well as knowing when your kid HAS TO GO #2! Its written all over their faces!!! No discount was offered for our inconvience & the hotel was FULL OF FAMILIES with children who would really have loved to take a swim!!! The rooms were clean the service was great! We arrived at 8 am and asked for an early check in and they accommodated us with no issues. Housekeeping was there early and there were enough towels and wash cloths. Breakfast was good and hot. It was a full breakfast and there was something different everyday. They had coffee and tea 24/7 free of charge. We came back home after our trip and booked for the 4th of July weekend. "If you need Wifi DO NOT get room 145"
For the price, we encountered several problems. 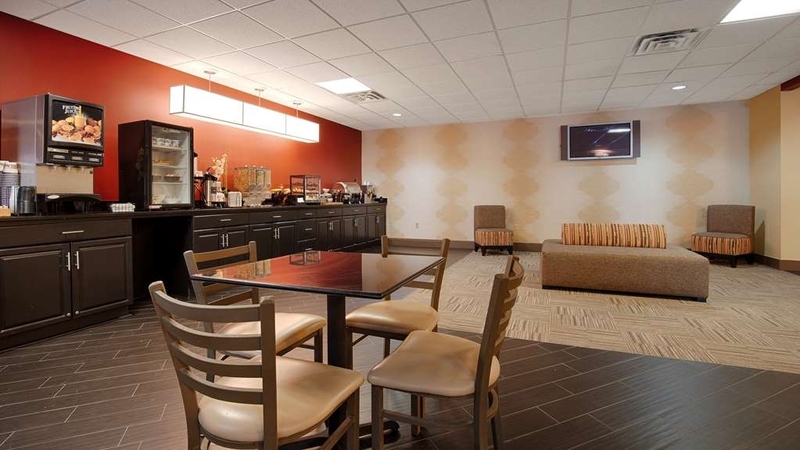 When you walk in, the breakfast area is right in plain view in the lobby. Not secluded or a seperate room. Front desk warned that wifi may be hard to get and offered a wire (unfortunately, a wire does not work for tablets. Front desk person was very nice. Our room had a slight musty odor, but was clean. When you sat on toilet seat, you felt like you were going for a ride. Chairs very uncomfortable. Bed was awesome. We stayed at this motel 3 years ago. Then I would have rated it at best average. The motel has made some very nice upgrades in service and remodeling. The room was very comfortable. The staff was very friendly and helpful. We enjoyed our stay. 4 rooms were booked under one name. It was to be on file that each guest checking in would submit their own credit card to pay for their room. This didn't happen. Also gave you names of each guest checking in and this didn't translate. Not a bad experience, but not a place I would choose again. It was clean and the breakfast was good. The yard was overgrown which would have been understandable since it had been raining a lot, but it looked like it hadn't been mowed for a lot longer than it had been raining. The bathroom fan kept turning itself on randomly for no reason all night waking us up. The internet was difficult to sign in to and the signal strength was very weak. The people were very nice, but we didn't enjoy our stay. "We hoped for a better experience"
First - the basics. This hotel is a basic place to stay, nothing more. Nothing fancy. Free wifi and free breakfast. Reasonable price. This facility is older and feels dated. We chose this last minute as we were driving through the area on a long trip. The first thing we noticed was the smell. It smells of overpowering cleaning agent and air freshener trying to overcome the smell of old, musty, and old cigarette. Our room definitely had someone smoking in it recently and we noticed that the moment we walked in the room. We turned on the A/C unit full blast to overcome that, and in the end, it was ok for us. The outside door, although it was supposed to be secure, would come open by yanking hard on it without the need for the key. The beds were comfortable, and the bathroom was at least presentable. Not sure I would go back here. For the price point, I'd bet there are other places that are newer, more modern, and not quite as smelly. PS - the choices for dinner in the immediate area are really limited. So, plan ahead. We spent one night at this location without time to check the reviews. That was our mistake. Our room was not clean, the CFL light bulbs were low wattage and our room was so dimly lit it was hard to read, one lamp didn't work at all, the fridge was falling apart inside and needed a serious defrosting. The in-room coffee maker had crud in the area where the water is put in. I wouldn't drink anything made in that coffee maker. It's hard to believe that the people who "clean" the rooms don't pick up on these defects. The flat screen TV was tiny. The wifi speed was 750k (DSL) and very slow and spotty. Seriously, DSL???? One step above dial-up!! How cheap can you get. Breakfast was also a disaster. The coffee is made from syrup and was undrinkable. The breakfast offerings were spartan. It is clear that the owner / operator is more concerned about cutting corners than providing a decent experience for their guests. We paid $70 with a travel coupon for a $40 room. Don't stop here, keep driving. If I were Best Western I wouldn't want my name associated with this hotel. Smell of cigarette in the hallways and rooms. Even though non-smoking now, it allowed smoking through January. Need to change out carpets, bedding, pillows, etc to get rid of the smell. The first room smelled too much so we were moved to a different room on the opposite side of the building. Pillows retained smokey smell. Ew. Shower and tub could have been cleaner. There are so many other hotel and motel options in the area.... I'd go elsewhere next time. Dear Valued Guest, Thank you for your review of our property. You are correct, we did change our property to 100% smoke free on January 1, 2016. Unfortunately we continue to have guests smoke in our non smoking rooms, which does leave a lingering smell. We have been diligently working to reduce or eliminate the smoke smell left behind in some rooms and will continue to treat them with the ozone machine for as long as it takes. We apologize you experienced this during your stay and hope you will provide us with the opportunity to serve you again. The internet didn't work, the toilet seat was in pieces, the key card didn't work in the outer doors and the TV clicker was ridiculous. You make the call. Oh, the room had an echo! After a drive of 600 miles I was so tired that I just went to sleep. I expected more from a hotel chain of this size but I was sadly disappointed. Dear Valued Guest, Thank you for taking the time to review our property. We would like to apologize on behalf of our entire staff for not exceeding your expectations. Your satisfaction is important to us and we will be using your feedback to implement improvements to ensure we offer a better experience for guests in the future. We hope you will consider staying with us again so we can have another chance to provide you with a superior experience. staff was very friendly & pleasant. will definitely stay here again & recommend to others. hunter & gracie were very helplful. was very pleased with appearance & cleanliness of this facility. thank you!!! Dear Valued Guest, Thank you for taking the time to review our property. We are please to hear that you enjoyed your stay with us. We do agree that Hunter and Gracie are very helpful and friendly to our guests. Our entire staff strives to provide excellent customer service. We hope to see you again soon! the surprise was on me . the exterior said older and dated, not unkempt just older. Price was a first a little high , I thought. However the lobby was immaculate , I was greeted warmly and with courtesy . the room was updated and well equipped, very clean , quiet, and best of all the beds were the most comfortable I had sleep on in months of travel. Dear Valued Guest, Thank you for your review of our property. We are very please to hear you enjoyed your stay. We will be updating the outside of our property this spring and look forward to the changes to be made. We appreciate your kind comments and hope to see you again soon! "Average Property with Nice Employees"
This hotel was a late choice on our recent road trip. While the hotel is very average, I must say that they people were very nice. A young lady named Belma greeted us and made our late night check in move smoothly. The next morning the staff was very helpful and asked to assist us several times. Again, the property is older, but we got to stay on the first floor close to the lobby and it went well. Thank you for your review of our property. We are glad to hear you enjoyed your stay with us. Our greatest asset is our staff and we are pleased they were helpful and attentive to your needs. We strive to provide excellent customer service. We hope you will be back to see us again soon! After a horrible stay last year on this same trip home to Maine from Georgia at the Chambersburg BW, the Carlisle BW was truly a breath of fresh air. In Chambersburg, despite all of the rooms in the wing I was in being labeled non-smoking, the hallway, room, linens, everything was saturated with cigarette odor. Carlisle was completely pleasant. We even got lucky with our timing and walked in as they were putting out a plate of warm cookies. I travel with my dogs and there was plenty of room to walk around with them and conveniently placed trash cans, both of which were lacking in Chambersburg. Very pleased to have found this location, I'll be back. Thank you for your wonderful review of our property. We are very pleased to hear you enjoyed your stay with us. We recently implemented the fresh baked cookies for our guests and we are glad you enjoyed the special treat. Soon we will offer treats for your little traveling companions. We hope to see you and your pets again soon! All good. Quiet, good night sleep. Staff helpful and pleasant. Free breakfast normal. But the motion sensors have issues. The fan and lights good on in the middle of the night. Good brand. FYI many restaurants have no booze. Thank you for taking the time to review our property. We are very pleased to hear you enjoyed your stay with us. Please email us at [email protected] and provide us with your name so we are able to have the light sensors fixed in the room you occupied. Occasionally we do run into issues with the motion sensor, and we would like to replace it right away. We would greatly appreciate it. We hope to see you again soon! "All good except the toilet"
General condition, breakfast bar, and service were fine---except the toilet was plugged when we first used it--(we did nothing to plug it) and when we called for assistance, the front dest clerk came down and handed us plastic gloves and a plunger to clear it ourselves. Sure, we do it if it happens at home, but I would expect correcting the problem to be part of the service. Thank you for taking the time to review our property. We apologize the front desk agent misunderstood your request. After speaking with her, unfortunately she assumed the clog was caused by the an occupant of the room and perhaps they would want to privately handle the situation. It is now understood by all staff that the service to fix the situation is to be offered going forward. We apologize you experienced this during your stay, but are pleased to hear you enjoyed your stay otherwise. We hope you will be back to see us again soon. Helpfull staff. No complaints. Would stay here in the future. Room was very clean and in good condition. I was traveling with a pet and usually pet rooms are not the best. I did not find this at this motel. Staff was very friendly. Key cards kept deactivating and side door locks were not working. Close to main roads. Used to be smoking and still has a little odor of smoke. Breakfast was good. Was very quiet. Not bad for the price. Thank you Lisa B. for your review of our property. We are happy to hear you enjoyed your stay. We agree our staff is fantastic and we are glad you were satisfied with them. We are working towards correcting our entry door malfunction as this is becoming a recurring problem for our guests. We did convert our property to 100% non-smoking on January 1, 2016 and have also noticed a lingering smoke smell in some rooms. To address this issue we have purchased a new ozone machine to try to reduce the smell in those rooms. Thank you again for your feedback. We hope to see you again soon! Thank you for your review of our property. We are happy to hear you enjoyed our newly implemented "Grab & Go" breakfast option. We have been working diligently to improve our selection and provide better breakfast options for our guests. In regards to our road signage, we do agree our road sign is a bit difficult to locate. We are however in the beginning stages of changing our road and building signage to reflect the NEW Best Western logo. We hope to have the project completed by the end of the year. Thank you again for your comments. We hope to see you again soon! Very nice hotel but in an area Exit 52B off I-81 which has almost no nice restaurants that serve alcohol.After a long drive, we were looking forward to a glass of wine with our meal - no luck. And the area of the hotel is devoid of grocery stores, etc. This hotel is very nice, clean and awesome comfortable beds. Hotel staff are great. The staff were very helpful providing useful information on local places to eat. I would recommend this hotel to anyone staying in the area. Dear Valued Guest, Thank you for your "Awesome" review of our property. Its reviews like this one that drive our staff to preform at the highest level. We greatly appreciate your comments and are please to hear you enjoyed your stay with us. We hope to see you again soon. Warm regards. Clean, comfortable, quiet, no problems. Easy access from Interstate 81 (about a mile) . Toilet and tub/shower appeared to be new. A typical Best Western experience (I usually choose BW because I've never had a bad experience with them). Quick checkin-in. The beds were extremely comfortable and staff was really nice. The bathroom looked updated and it was pretty quiet (stayed on a Tuesday night). Breakfast was okay (bagels, cereal, sausage & eggs). Everyone was extremely friendly! Price was the lowest in the area for what you got. Very pleased! "Hard to find but worth the hunt"
Limited truck parking and tight to get into. From I81 take ex52b hwy 11s. Pass I70 exit, cross under I70 and take an immediate left. There behind motel 6 and share the same driveway but it's real tight with a big truck. They take corporate lodging card. The only problem was the room phone didn't work and was never fixed. "Where to stay for good price and excellent stay"
We were looking for a nice place to stay the night, not too expansive but where the bedding is good cause we like to sleep comfortably. We were very satisfied with our choice of this Best Western in Carlisle, a quiet place, not noisy, with employees very nice . We recommend this hotel warmly. "Clean but no hot water." This hotel seemed clean, however, we had to change rooms twice due to lack of hot water. One room had a cracked/jagged tank cover, another room had a GROSS tub! The "non-smoking room" smelled of smoke. Luckily, the hotel was not booked solid so we could change rooms TWICE! i do not plan to stay here again!! Finding the place was a bit more tedious then normal. Prices were okay , priced just right at a little under $100.00 Front desk clerk was amazing , His suggestions were right on with places for dining. Overall , He mad our experience the best it has ever been. Thank you Hunter ! "Best budget hotel to stay in Carlisle"
Best budget hotel to stay in Carlisle. 1) Receiving = Good. 2) Ambiance = Good. 3) Room = Good. 4) Amenities = Good. 5) Breakfast = Ok. 6) Gym = Ok. 7) Check out = Good. 8) Parking = Good. 9) Staff = friendly. 10) Location = Just 15 minutes to Harrisburg, PA. This Best Western was for an overnight stop. The price was right (under $70) and it met our needs. The room was clean and the bed comfortable. The breakfast was marginal but our expectations were low. I spent two nights and it was a great choice. The room was clean and quiet. I had a room on the back side which might be a perfect choice for a good nights sleep. Breakfast was the usual fare - nothing out of the ordinary. It was fine for a quick bite to start the day. Staff was very nice. My husband and I stayed there for one night. The bathroom was dirty as well as the jacuzzi. The room are not quiet you can hear everything from other room. Very disappointed. We also left at 6 am and asked for a croissant to go and nothing was available ! Although the pm front desk agent was nice. The hotel is just under $100 ....So for that money it is a good value. Lots of comforts that are often found in a higher priced place There are premium channels...easy to reach plugs ... Washing machines Comfy bed Good breakfast included Good parking. Convenient location to visit Dickinson. Room was clean with wifi, small fridge and comfortable beds. Continental breakfast area is small, but adequate. Plenty of breakfast joints nearby. Would definitely recommend for a no-frills motel. My husband and I were visiting our daughter at Dickinson College for Parent's weekend. We stayed 2 nights. The negative experiences started with check in. We arrived at 2pm and check in was not until 3. We asked if we could check in early and the clerk told us yes, but it would cost 25 dollars extra. I have arrived early at several hotels, and as long as there was a room available, the staff always worked with us and allowed an early check in. When we entered our room, I immediately noticed the mold and mildew in the shower and toilet. The shower was handicapped accessible and there was a slotted bench in it. There was black mold in between all the slots. The toilet had a rim of mildew around the water line, and there was mildew covering the bottom of the seat and the hinges of the seat. We went to the front desk to request another room and had to wait about 5 or ten minutes before anyone came to the desk. The woman did not apologize, but did give us another room. She did not seem concerned at all that a customer just told her that the bathroom was covered in mold. The bathroom in the new room was much cleaner, but not as clean as it should have been. There was mold on the toilet seat hinges and dirt and dust in the corners of the floor. The tv would not turn on, so, again, we went to the front desk which was unattended, again. Finally, a man arrived and came to our room. After fiddling with the tv for a while, he got it to turn on. He had to get a new remote and synch it to the tv. We left for dinner, and when we came back, the tv would not turn on, again. He returned with a different remote and got the tv to work. After he left, we noticed that the volume on the remote did not work. We could barely here the tv. It was not worth it to us to have to track someone down and have him in our room for a third time. The following morning we missed breakfast. We arrived at 9:15, and someone was cleaning it up. Their literature states that breakfast is served until 9:30. (in my opinion, 9:30 is very early, especially for the weekends) The hotel looked freshly painted with new carpet, but there was a weird odor, especially in the hallways. I didn't expect anything great for the price, but cleanliness and a friendly and hospitable attitude from the staff would have been greatly appreciated. I got the feeling that the staff was comprised of family members who were not concerned in the slightest about keeping their customers satisfied. "Why stay at the Carlisle Best Western?" This is a repeat location for us whenever we travel on the PA Turnpike I-76. We always try to time our travel so we can spend the night in Carlisle's Best Western Hotel. 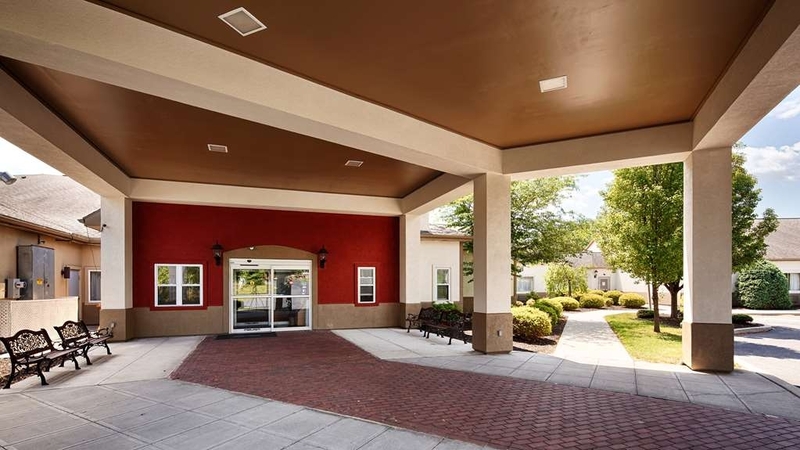 The rooms are comfortable and clean; the microwave, frig and coffee maker are great amenities, and the table and chairs in the room are appreciated. The hot breakfast is a real treat and the breakfast room is kept well stocked by the attentive staff. The desk clerk has without exception been pleasant and helpful. We think it is a great place to stay. It is an easy on/off from the highway. "A Charming Hotel with lots of smiles"
What a charming Hotel that sits off the toll turnpike. We just happen to be going threw town the same time a car show was there. the price was cheaper for two than the hotel in front of it. The hotel 6 was gouging people because the car show was in town and The Best Western front desk was so friendly and was so much cheaper with a Breakfast. The beds were clean, plenty of towels, and cold air conditioning. That next morning breakfast was hot and smelled so good. First time I ever ate a waffle. so many things to choose from at Breakfast . Next time we pass that way we will stop in again.